Photos by the talented Abby Camarata. I began talking to A in early June, just as she was finding out that she was expecting. A was desiring a HBAC (home birth after cesarean). Her pregnancies were IVF blessings. Her first baby, Elijah, was a failed induction that was rushed into a cesarean for failure to progress. He was 13 months when she found out she was expecting and everything seemed good for a TOLAC (trial of labor after cesarean). Mid-June A discovered that both embryos took and she was expecting twins. I will not deliver twins at home, so A and I talked about other midwives that she could call as well as OBs. I offered to doula for her if she desired a doula and she excitingly took me up on the offer. A talked to a couple midwives, but nothing was working out. She met with an OB who she connected with and was on board for allowing A to have a TOLAC with twins. Everything was falling perfectly into place. Over the months, A and I worked on a birth plan. In the second trimester, a new doula Hunter joined our team. A was well researched and had excellent plans for her birth no matter what the outcome. The day before Thanksgiving, A text me in a panic. She had her 28 week appointment and it did not go so well. She did not want to have her babies in the hospital. She had to have them at home. We talked and I suggested another midwife for her to speak with, Darlene. She spoke with Darlene, they met and Darlene felt good about taking Angela on for a HBAC with twins. A lot of twins come early, so that was one concern with a home birth. No issues with Angela though. 37 weeks came easily. By that point, she was having lots of braxton hicks contractions. It was obvious her body was preparing. On January 29, I sent A a text letting her know that I had a patient in labor. She was feeling antsy and decided to come over and have me check her. She was 2-3cm/90% effaced/ 0 station. I did notice that A had scar tissue on her cervix. We discussed the scar tissue and I told her I would come over and try to work on the scar tissue after my mama had delivered. I told her she should be fine while I was away delivering another baby. Moments before my mama in labor was pushing, I receive a text from A’s other midwife Darlene stating that another midwife was over with A to check her. There was no change. She was having some hard contractions and thought she could be in labor. I soon heard from C, A’s husband, and asked them to keep me updated. The next morning, things had slowed some. I went over to A’s mid morning to do a cervical check, membrane sweep and work on the scar tissue. The first cervical check I found her to be 4-5cm/90%/0, with a bulgy bag of water. We did the sweep and worked on the scar tissue. Lots of bloody show on the glove. We went out for a nice walk, adding curb walking here and there. Contractions were coming every 5-10 minutes. It was a nice quiet day of laughter, chatting and contractions. Things continued all day, with contractions getting longer and stronger. Then around 6pm, everything fizzled. We decided the best thing to do was for A to rest. She was going to see Darlene the next morning and would see if anything was different then. A’s appointment went well the next morning. Darlene swept her membranes, which brought on cramps and some contractions. A asked if I would work on her scar tissue again that evening. I found her to staying at 4/90/0. Using arnica oil, I massaged on the scar tissue again and swept her membranes. A had regular contractions all evening, but no labor. The next morning, A went to see Frank, my acupuncturist, to induce labor. He worked on her for three hours and a regular contraction pattern was established. That evening, things changed with her contractions. She retreated to her bed room to take a bath and to focus on her labor pattern. A was beautifully prepared with affirmations, scripture and tips to get through the rocky parts of labor. Around 10pm on February 1, A text me. She was feeling discouraged with all the start and stop contractions that were not going anywhere. C was sleeping, and she was having painful, regular contractions that baths and benadryl were not taking away. I offered to come check her, and she said she did not want to call me over for another false alarm. By 11pm, she asked me to join her. When I arrived, things were definitely different. I checked A and found her to be 5/90/0. Contractions were quite regular and intense, coming every 3-5 minutes, lasting a minute long. When a contraction would come on, A would get up and walk or squat, holding onto her hips. I asked if I could call her primary midwife, Darlene and she asked me not to at the moment. She wanted to get to a 6 before calling the birth team. By 1am, Hunter (the doula) and Abby (birth photographer) were arriving. The contraction pattern was holding up. Soon A allowed me to wake C and he came down stairs with us. The decision was made for C to call his mom to pick up Elijah. As Elijah was leaving, the rest of the birth team arrived. We set up the birth pool and began to fill it so it was ready for A when she wanted to get in. A labored so beautifully. Dim lighting, beautiful labor music and surrounded by her affirmations and support. A changed positions often. She would sit on her bed, then walk around her room. She would alternate laying on her sides, focusing through each contraction. No labor is complete with out laughter. Earlier in the week I had shown A and C a great birth You Tube video that she requested to see during labor. Soon A asked to get into the birthing pool to see if it will help with the contractions. A melted into the water and found the contractions easier to manage. She also was able to get some much needed rest in between surges. A was exhausted and wanted to try to rest in her bed. She got out and worked through a few contractions on her bed. Then got back into the birthing pool. Then got out and did stair climbing for a few minutes, before getting back into the pool. We dimmed the lighting and tried to let A have some space with C to rest as she could in the birth pool. A strength was amazing and empowering. Her contractions were not giving her much of a break, but she powered through. Riding the wave of each contraction, resting in between. At every exam through the night, A was found to be 5cm dilated and was not budging. A little after 7am A decided to get in her bath tub to labor. She asked Darlene to check her. No cervical change was seen. It was obvious at this point that A was having some labor dystocia. I talked with A about the possibility of breaking her water and seeing if that helped with dilation. A was very exhausted and did not know how much longer she could go on, and if she could handle contractions with her water broken. All of which is very understandable. A decided she wanted to transfer to the hospital. We had two options: Go to the Pavilion where her OB was who said he would care for in a transport or go to Ben Taub which is not a lovely hospital, but she would have a very good and fair chance at continuing her TOLAC. The on call OB at the Pavilion was not supportive of a TOLAC and told her she would do a RCS upon arrival. She said she would call A’s original OB and get back with her. A, C and I loaded into their vehicle and headed to the medical center. Darlene handed me an envelope with records. We planned to head towards Ben Taub unless we heard differently. I looked through the envelope and discovered there was no surgical report in there. I discussed this with A and C and knowing it would be a struggle at either hospital to get a TOLAC, they decided to go to the Pavilion. We arrived at the Pavilion and the nurses got A settled in triage. A was still 5cm and in a lot of pain. The nurse gave her a dose of morphine through her IV while they waited to be able to give her an epidural. Immediately we were told the on call doctor and A’s original OB would not see her. There was a resident on call who was more than willing to allow A a TOLAC with twins. She went over the risks and benefits with A and then did an ultrasound. The ultrasound found Patrick (baby b), who was head down on Friday’s ultrasound, to now be breech again. The resident told A no worries. She had no problem delivering baby b breech. The only issue was that A had to push in the OR and could have none of her support team, but her husband. Soon A was able to get her epidural, and then was able to fall asleep and get some much needed rest. Hunter, Abby and myself went downstairs to eat lunch and then came back to sit with A. She was still sleeping so we all caught a much needed nap. A began making good cervical change about every hour or two once she received the epidural. As 6pm rolled near, A was feeling lots of pressure. A was found to be 9.5cm/100%/+1/2. The nurse ran out to call the doctors and to get things ready in the OR. A really wanted all of us to be present so she tried pushing with her contractions, until her nurse caught her and nicely asked her to wait. A and C went with the staff to the OR and we anxiously waited for a text from C saying the boys were here and that mama got her VBAC. And we waited. And waited. And waited. The longer we waited. The more anxious we got. Hunter went out and asked the nurse for an update and we were told baby a (Rory) was born, but no further updates. We continued to wait. One of us received a text from C stating the boys were born, but Patrick and A weren’t doing well. Please pray. We had to continue to wait for quite some time. Anxious, a nurse finally came for me to come back and be with A. I found A holding her sweet Rory, in a fog and upset. She stroked his sweet little body and kept saying she was suppose to be holding two babies. My heart was breaking for her. A pushed for approximately 45 minutes and Rory was born vaginally. It was difficult to push on a hard surgical bed, and having an overextended uterus, it was much harder for her to tell when she was having a contraction to push Patrick out. Patrick began showing signs of distress, so they tried to deliver him by vacuum, but it did not work. Patrick had to be born by emergency cesarean. His apgars were low and he was whisked away to the NICU. Patrick was in the NICU for 12 long days, but was very excitingly welcomed home by his sweet family on the twins estimated due date. Welcome to the world sweet Rory and Patrick. Rory weighed 7.5#, 20.5″ long and Patrick 6.9#, 19.5″ long. 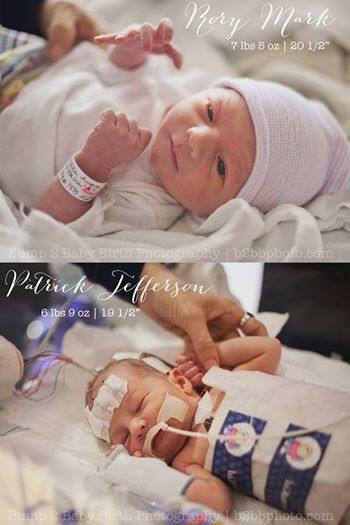 Such beautiful, sweet little boys born into an amazing family. Your mama is an amazing woman whose strength is empowering. So honored to have been part of your birthing journeys. To read A’s story in her own words, follow this link to her blog.